As parents it’s always challenging to find something new and exciting for your child. One of the lessons we are taught young is to have a routine to help us accomplish tasks. Well, when you have a curious toddler, routine…doesn’t cut it. For us routines are still very important but there are some areas where we can break routine to give her new experiences. I didn’t let Brian in on the plan so he was just as startled as Reagan when I turned out the lights in the bathroom. Our upstairs bathroom is windowless and when the lights go out it is dark. The green and blue glow of the glowsticks immediately sparked interest in Reagan. “Whoa, what’s that?” she squealed in delight. 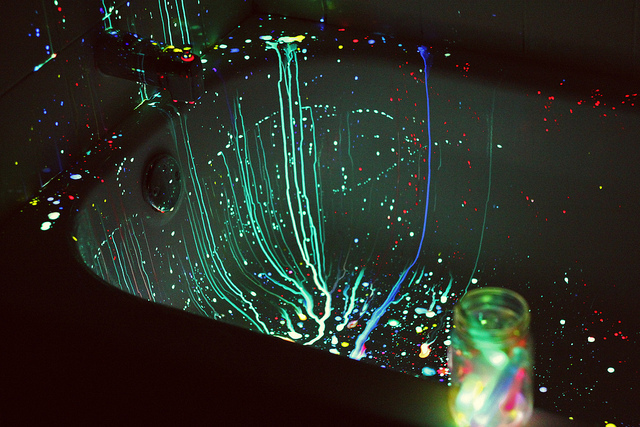 “Mama brought you glowsticks for the tub, cool!” Brian answered her. Reagan started giggling and reached out her hand for the glowsticks. She was utterly impressed buy how pretty it was. “Pretty,” she kept saying over and over. Who knew that a couple glowsticks in the bathtub would make her so happy? She twirled them around and dunked them underwater. She threw them from one end of the tub to another. She had such a blast. She already loves playing in the tub but this brought her tub experience to a whole new high. When it was time to take her out and get her ready for bed she clung to her new found loves. She insisted that she take them with her to bed. We gave in to her demands and laughed as we watched her on the monitor making the glowsticks fly across her face in the dark room. After she had passed out I went into her room, took the glowsticks from her grasp and placed them on the dresser. It was priceless that something so small could mean so much to a toddler. I highly recommend it!